Spherical Roller Bearings are offered in extended life version. Optimized for service life longevity, FAG E1 bearings with ODs over 320 mm are available in X-life premium quality versions. These double-row, self-containing units are comprised of solid outer rings with concave raceway, solid inner rings with cylindrical or tapered bores, and barrel rollers with cages. Suited for use where bearing performance specifications remain unchanged, products feature compensation for shaft misalignment/flexing and support axial forces in both directions. A new range of spherical roller bearings is now available that offers up to 60 per cent longer service life, higher limiting speeds, increased load ratings and lower energy consumption, resulting in reduced operating costs. Schaeffler Group's FAG E1 spherical roller bearings with outside diameters larger than 320mm are now available in X-life premium quality versions, providing significantly improved bearing performance. By converting the standard FAG E1 spherical roller bearings to X-life quality, customers benefit from a 15 per cent increase in load ratings; 50 per cent higher limiting running speeds; and up to 60 per cent longer service life compared to their predecessors. This means that in applications where bearing performance specifications remain unchanged, customers can reduce costs by downsizing and installing smaller, more cost effective bearing solutions. These improvements in quality, performance and running accuracy were achieved by developing new cages and rollers with new dimensions and crowned faces. Schaeffler's FAG range of spherical roller bearings is ideal for demanding operating environments, particularly for applications in which very high load carrying capacity and reliability are key design criteria. Spherical roller bearings are double-row, self-containing units that comprise solid outer rings with a concave raceway, solid inner rings and barrel rollers with cages. The inner rings have cylindrical or tapered bores. The symmetrical barrel rollers position themselves freely on the concave outer ring raceway, which compensates for any shaft misalignment or flexing. Spherical roller bearings support axial forces in both directions and high radial forces. The bearings are designed for very high load carrying capacity and, because they are designed with the optimum number of large barrel rollers, are also suitable for heavy loads. Also, due to the close contact between the rollers and raceways, uniform stress distribution is achieved in the bearing. Many bearing sizes within Schaeffler's spherical roller bearing range can now be converted to X-life quality. 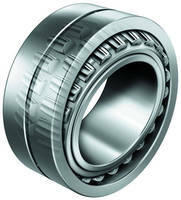 These bearings have no central rib on the inner ring and are therefore able to use longer barrel rollers. In addition, the bearings benefit from improved kinematics, optimised surfaces and are made from higher performance materials. As a result, the basic dynamic load rating and basic rating life (under identical operating conditions) is significantly improved. Of course this means that in certain applications, a smaller bearing solution can be designed. For the customer, these benefits translate into higher machine availability, new design possibilities, more economical bearing supports due to downsizing; and lower operating costs due to reduced energy consumption. The most up-to-date kinematics technology and software is used to develop these bearings, which are made from superior quality materials. Performance improvements were made possible by modifying and improving the bearing contact geometry and bearing kinematics. This included adding longer rollers with larger diameters, which results in higher load ratings. Surface improvements on the rolling elements also enable a lubrication film that is capable of supporting even higher loads. Improved osculation conditions and additional profiles further optimise the rolling contact. Modified osculation and precise rib geometry increase the load carrying capacity of the rib contact. A new sheet metal cage with improved roller guidance and lubrication support, reduce wear and extend the life of the bearing. For more information on Schaeffler's FAG E1 spherical roller bearings, please visit www.schaeffler.co.uk or telephone the marketing department on 0121 351 3833 and request catalogue WL43 170. With a total of 66,000 employees at over 180 locations around the globe and group sales of 8.9 billion euros (fiscal year 2007), the Schaeffler Group is one of the world's leading rolling bearing manufacturers and automotive component suppliers. The corporate group includes the INA Group with headquarters in Herzogenaurach, the FAG Group based in Schweinfurt as well as the LuK Group, with headquarters in Bahl.